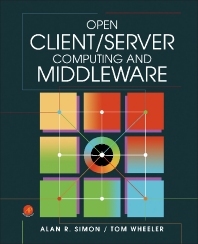 Open Client/Server Computing and Middleware provides a tutorial-oriented overview of open client/server development environments and how client/server computing is being done. This book analyzes an in-depth set of case studies about two different open client/server development environments—Microsoft Windows and UNIX, describing the architectures, various product components, and how these environments interrelate. Topics include the open systems and client/server computing, next-generation client/server architectures, principles of middleware, and overview of ProtoGen+. The ViewPaint environment, ProtoView screen manager, SQLView visual database access, and ProtoView WinControl library are also elaborated. This text likewise covers the interaction with db-UIM/X, widgets and building interfaces, network object toolkit, and integration of cross-platform components. This publication is suitable for computing professionals and researchers interested in open client/server computing. Tom Wheeler has a long track record of building organizations to develop commercial software, including products for financial services and contact centers. He has built, sold and been a senior manager in a variety of different types of companies, including international conglomerates and garage-sized start ups. He first created the Six Week Solution back in the 1980’s and has been fine-tuning it since. VP of Research and Development at ClickFox; he has built, sold and been a senior manager in software development companies for more than 20 years.